Wednesday is one of two market days in La Palmyre. We’d been in to the Sunday market which was absolutely heaving with humanity. Now, after 2.5 weeks in France and without yet having had a spinning (rotisseried) chicken, we fancied trying the market again, hopefully being quieter on a Wednesday, to remedy the situation and buy un poulet rôti. I think it’s the unseasonably poor weather that we had during the first two weeks that has been responsible for our missing out on many of the things that define, for us, being in France. Let’s hope the remaining time is good enough for us to rectify things. After Carol’s breakfast run to the local supplier of splendid croissants, we cycled in to La Palmyre and hit the market. As we had hoped, life was much more civilized – very much calmer. We were able to purchase some good looking green beans, an enormous spinning chicken that would do us for two lunches and a dinner (at least), and some picholines, a typically French green olive. Olives were another thing we had yet to sample on this trip. Unless one is sitting outside in the sun supping a pastis, they somehow don’t seem relevant. Sauntering back with our purchases, we spotted an Internet cafe proclaiming free Wi-Fi, so perhaps we wouldn’t need to use any of our precious diesel on a second McWiFi run to Marennes. I did have to use a little precious diesel taking my punctured tyre to be repaired five miles away. Since I had to leave it there being done, I had to use a little more to return and collect it. Having shelled out the not inconsiderable sum of €29 for a puncture repair, I gave the car a severe ticking off about causing us too much unplanned expenditure. That’s the cost of a decent oyster lunch with wine, for Lord’s sake! In the late afternoon we cycled through the forest to the coast and into La Palmyre again, lugging the camera along in the hope of seeing some more kite surfing. Alas, the tide was a very long way out so no kites were surfing. It was most enjoyable and none of it got pinched by an epicurean sparrow. Thanks for the food picture. 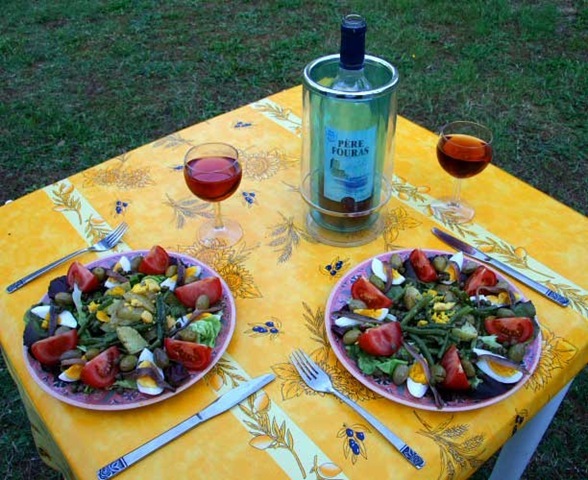 I am salivating looking at the pix and what a very French tablecloth. I am glad you are keeping up standards!